Oh, I almost forgot to finish up with the filter recommendations, I've already covered Tiffen (3/7 post below) and B+W, (3/11), this time it'll be Hoya. I just noticed all my Hoya filters are made in Japan by Tokina! I use an HMC super UV(0) 62mm or 77mm on the Sony CZ 16-80mm for protection in dirty or wet environments; the filter is a little pricey but I didn't want to compromise any image quality by using something cheaper, although I'm not sure if it offers better image quality than a cheaper model. One thing you can do to help reduce the cost of filters for Sony lenses is buy only 77mm, and use a 62mm-77mm or 55mm-77mm step-up ring (or whatever size your threads are) for lenses that use smaller filters. The downside to this is the original hoods won't fit, but with zoom lenses, hoods don't work very good anyways. The step-up rings shouldn't cause any light fall-off because the filter is so much bigger than the lens' original filter size. As I pointed out in the 3/11 post below, I keep a Hoya HMC ND8 filter for slowing action, such as water in bright conditions. A ND8 is 3 stops of light loss, which should be enough for most conditions, but if you're trying to blur the subject background by using a large aperture and trying to keep a slow shutter speed, you'll probably need to add a ND1.8 which is 6 stops, for a total of around 9 stops, that would slow the shutter speed significantly. Nine stops of light is the same as going from a shutter speed of 1/500 to 1 sec. None of the filters mentioned above are "thin" type, which are more expensive, but thin filters are not normally necessary unless you're stacking filters, and/or using the widest aperture and already have light fall-off issues from just the lens. Light fall-off or "vignetting" doesn't bother me, but everyone has different peeves. Here's another sample interior picture using the now defunct Sony A700, although this camera will take the same quality pictures if used properly. In this scene, (which is actually a dining room but the home owners were using it as a sitting area) I'm using two HVL-F56AM Sony flashes (now also defunct) with stands and umbrellas, the Sony A700 and Sigma 10-20mm F/4-5.6 lens, and firing the flashes with a radiopoppers trigger. There's a huge window on the right (partially visible) which had a roll-down diffuser, so I used it to block out the sun which was shining in the room directly, and would've caused some major lighting and reflection issues with the glass table, picture glass and windows on the left side. Sometimes I really like the look of the sun streaming through windows, but not when it screws up too many things! This shot required a flash with an 8' stand and 32" shoot-through umbrella on my right (set to about 1/8 power), situated as high as I could get it and pointed down about where the base of the clock and background right chair are, with the intent of getting some fill light in that area to better highlight the clock case wood, and chair seats. I used the same basic flash umbrella set-up on the left, and pointed it down and over the left chair towards the large right side window to work some fill light into the chairs, and provide more contrast to the fabric. The huge window and diffuser was the major light source, I just filled in some shadow areas and added a little contrast with cross lighting to make the image pop. There was a concern whether the nicely painted recessed ceiling would get enough light, so I used a third flash (hand-held) set to the minimum 1/32 and pointed it directly at that area. As it turned out, I didn't need any extra light, and it caused the wall above the center window to be a little too light, but I was able to work most of that out in post processing. Thoughts; I'd possible take off the umbrellas, and use a stop or two less flash power and see if I could concentrate the light more towards the chairs and rug, leaving everything else alone. The white walls don't need additional lighting. Composition wise; I like it ok, although it's off-center, which bugs me a little, sometimes I get hooked on symmetry too much I guess. I'd shift the chairs, table and rug slightly counter-clockwise, and move the camera position to the left to try and get more of a diagonal look. I used a very wide 12mm, which is pretty flat with the sigma 10-20mm, but there are tell-tale signs of mustache distortion along the edges of the image if you look closely. Normally I don't like using a focal length this wide, but it worked here, as there were no better alternative views or positions IMHO. This image is from a single shot. I did the usual shadows/highlights, rotate and crop adjustments, and took out a reflection in the center window. Camera settings; manual, F/7.1, ISO 200 1/100sec AWB, 12mm (18mm equiv). The inexpensive Vivitar 85mm F/1.4 turned in a darn good performance, making an medium telephoto 85mm F/1.4 accessible to cost-conscious Sony DSLR people, as this wonderful lens is priced $1000 less than the Sony CZ 85/1.4 planar! How does the Vivitar stand up to the CZ, or Sony 85mm F/2.8 SAM? Check out the full review of the Vivitar 85mm F/1.4 here. I added a small bonus section at the bottom of the review page comparing the Sony 85mm F/2.8 SAM with the Vivitar 85/1.4 at F/2.8-8. The Vivitar 85mm F/1.4 is a full-frame compatible lens, but works fine on APS-C cameras. One thing I noticed with this lens is; light fall-off is so heavy at F/1.4 that you'll probably need to drag the shutter at least half a stop for a correct exposure, so that means the light gathering ability is not really F/1.4, it's more like F/1.8. Of course, depth of field is still the same, and backgrounds can be wiped out easily with this lens, just make sure you focus accurately. Note; bright daytime use at F/1.4 will often result in having to use a shutter speed of 1/8000 at ISO 100, yes 100! Most consumer grade cameras don't have 1/8000sec shutter speed, (the pro use Sony A700/A850/A900 do) so you'll need to use a neutral density filter (this two stop Tiffen will work great) to bring down the light value and allow your camera to get the proper exposure. I thought I'd mention a few new items that Sony camera owners might be interested in. The Sony CLM-V55 ($399) is an add-on 5" WVGA 800x480 screen using an HDMI port, and mounts to the camera hot-shoe, or if you are using a flash, you can mount the screen off camera, with an "L" bracket hot-shoe set up. It takes the Standard Sony DSLR battery (NP-FM500H), or a couple of different video batteries. This screen is not just for video, it can be used for live view still shots if you need a fully adjustable screen for easier viewing when setting up a shot, or would like a better screen than the one on the camera. I've noticed the newer hi-res tilt/swivel screens on Sony cameras are not as good as the ones used on the A700-A900, they don't have the same dynamic range or color, and I'm guessing the CLM-V55 is much better, but I don't know for sure because I've never seen or used one. Hopefully, I can review one soon. 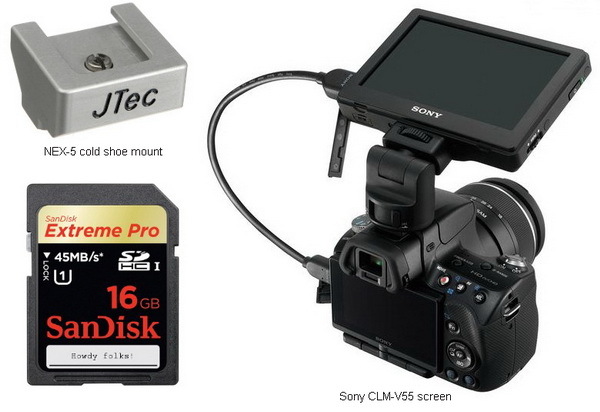 Also new is the JTEC cold shoe mount ($59.95) for the NEX-5 camera, use it to mount accessories like the thing above. Too bad there isn't a connection for firing a flash, just a dumb mode center connector would be great. This Sandisk SDHC extreme pro 16gb card would be a good choice for the newer Sony cameras with video, and it's priced right at $69. 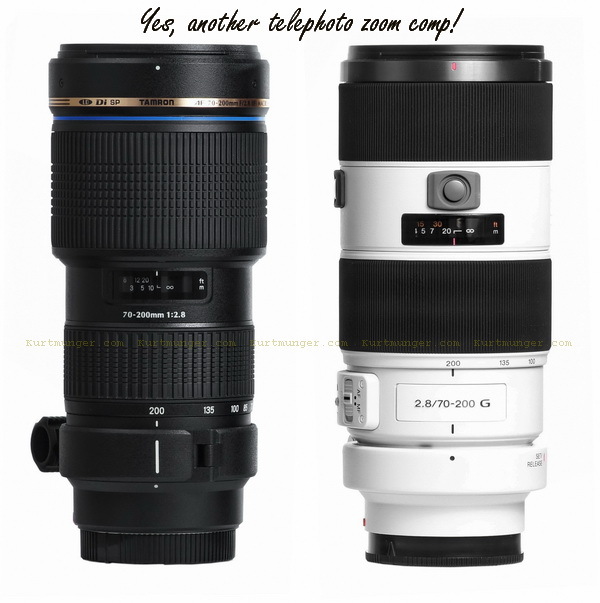 If you have a Sony camera and you're in the market for a 70-200mm F/2.8 lens, check out this comp. Right now, I'm comparing the Sony and Tamron models, but plan to add the two Sigma's (HSM and HSM OS) when I get them done, hopefully next month. Optically, the results show a toss-up in my opinion. The Tamron can definitely hold its own against the Sony, and even slightly exceed the Sony in off-center performance if you look closely. If focusing speed and build quality are important, the Sony is the clear winner. Noticed; the 10mp Sony A230 with 18-55mm kit lens, $349.99 brand new! Or a used one for $269! This inexpensive DSLR would be a nice transition from a pocket camera, or cost effective backup for part time photographers. If you're on a budget, (and who isn't now days) don't worry about getting the latest camera with all the tricks. If you can't take good pictures with a DSLR starter model, it's not the camera's fault, it's a lack of preparation, creativity and knowledge by the operator! Are you looking at moving up to a DLSR, if so, don't be concerned about megapixels and noise reduction; work on light and composition first. Why would part time pros, like weekend Real estate and wedding photographers want a starter camera as a backup? Part time photographers probably can't justify an expensive camera as a backup, or an expensive primary in many cases. Ten megapixels is plenty of resolution for almost all work, including magazine cover shots. How do I know that you ask? I used a 10mp Sony A100 when I first started in Real Estate photography, and made a couple of magazine covers for local homes magazines. I even cropped one image in half (cover required a vertical, and the original was a horizontal--not my fault in this case, fickle agents and editors) and it still looked sharp with a final print size of 8.5x10" (216-254mm)! Of course you have to make sure your focus is right on, with a reasonably sharp lens setting, like F/5.6-8 etc. Oops! I forgot something in the fisheye review, and have now added it towards the bottom. The Vivitar 7mm F/3.5 fisheye lens covers a larger area than the full frame Sony 16mm F/2.8 fisheye, used on a full frame camera, in this case the A900. It's noticeable right off if you have both lenses. 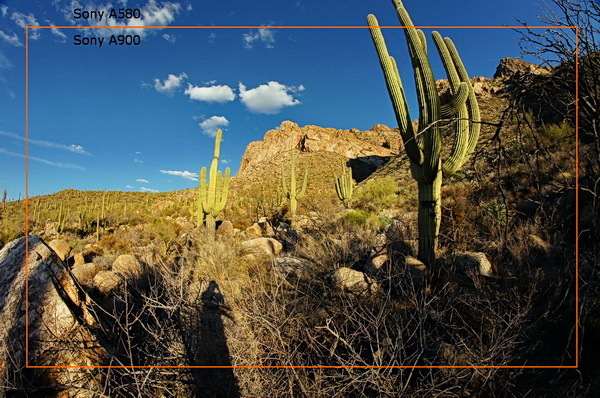 The full image below is from the A580 and Vivitar, and the orange crop mark is the coverage area from the A900 and Sony 16mm fisheye. This comparison is just for fun as it makes no sense to use either one on the other format. I think it's great the APS-C lens has a larger coverage area, that make the Vivitar even more useful and fun! This boring image does not take advantage of the fisheye effect, it just makes the Saguaro cactus look crooked, but I took both cameras and lenses with me on a hike to test them out, and decided to see the coverage differences at this point along the trail---and here you are. Full review of the Vivitar 7mm F/3.5 fisheye lens. The Vivitar 7mm F/3.5 fisheye manually operated lens is fun to use, and easy to use. It has a good build quality, very good performance stopped down, and most importantly, it's affordable! Just remember when shooting with this type of lens; good results are predicated on exploiting the fisheye "look," or perspective, with lighting considerations being secondary. Don't worry about sharpness, color fringing, and all the other stuff that has little to do with making a good picture. If you're outdoors, stop it down to F/11 and set focusing to infinity and shoot! To meter correctly, just check your LCD and use exposure compensation as necessary. Believe me, it's an easy lens to use, don't be intimidated by the all manual operation. Optically, this fisheye lens is quite good, and I'd highly recommend it for people that have APS-C cameras. It's sharp stopped down, and control of color fringing, light fall-off and ghosting is above average. Cost conscience people will want to look closely at this lens, as it's one of the few inexpensive fisheye lenses made for exclusive use on APS-C cameras today. Although Sony's 16mm F/2.8 fish-eye (review) seems a little sharper in the centers, it's also much more expensive, and not appropriate for use on an APS-C camera, as the distortive effects are diminished by the crop factor, that's why it doesn't make any sense to directly compare them. Also note; The Vivitar 7mm F/3.5 fisheye is being marketed under various brand names including; Bower, (which uses "8mm" instead of 7mm, but that's just marketing BS to make you think it's different) and probably Samyang, Walimex, Opteka, Rokinon and Falcon. Here is another example of some work I did some time ago with the outdated Sony A700 and inexpensive Sigma 10-20mm lens, (review). Any DSLR is plenty capable for this kind of work if you use it properly. 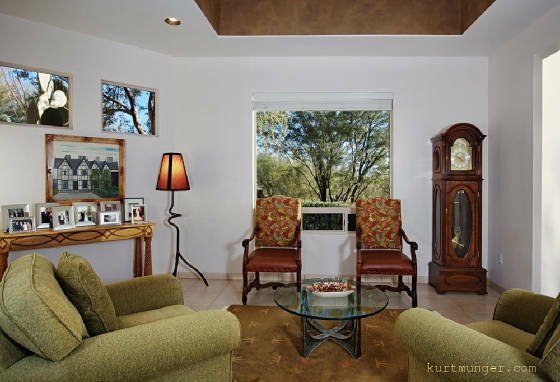 The image below is from a real estate shoot showing the dining room of a little ground floor condo, it's a very small room, (about 10x12' or 3.0-3.6m) and loaded with furniture and windows. Shooting this room required three flashes. Not seen, but just off to the right is a mirrored wall, and a doorway to the kitchen. I didn't have enough room for a flash on the right, (and I didn't want to shoot into a mirror! ), so I put a flash on a stand with a shoot-through umbrella in the kitchen doorway, high up, and pointed slightly down. I also have a flash with umbrella located about 6' (1.9m) to my left and behind the camera, set to about 1/4 power of the kitchen flash, and I'm hand-holding a flash with umbrella over the camera, also set to about 1/4 power of the kitchen light, (I think that flash was at 1/2 or 1/4 total power, and the other flashes are about two stops lower). You can see the shadows formed from each flash, by looking at the chair legs, lamps and cabinetry. Speaking of flashes and shadows, you might notice the chair legs shadows from the flash I was holding, which was closer than the left flash; I hand-held it because there wasn't enough room for a stand, and I wanted more diffused fill light. 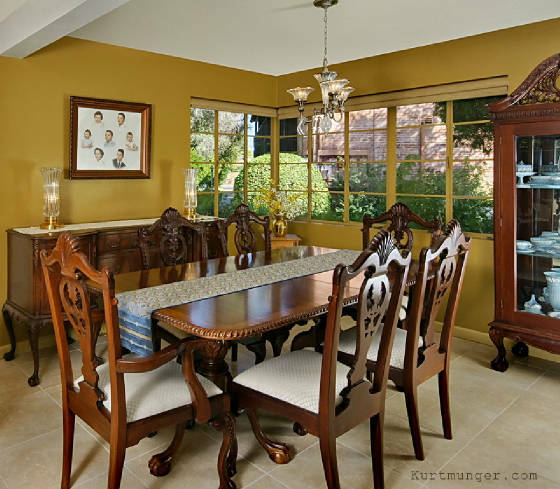 The china cabinet legs and buffet lamps show the kitchen light direction, but are also diffused, partly because of the window light. My decision for the left flash behind the camera was too provide general fill light, and provide enough light to keep the window mullions from blowing out, without a reflection on the panes. Usually you can bounce the flash off the ceiling or walls to diffuse it better and avoid shadows, but in this case there is a larger area behind me with no wall space to speak of, and there's a ceiling beam too, upper left, so bouncing light off the ceiling into the dining room wouldn't work, as you would wind up with a huge shadow extending way past the beam into the dining area. Thoughts; I'd turn down the flash power just a little, or close the aperture more, and slightly turn the two right chairs to minimize reflections. Other than the color of the walls, (ode to vomit!) I like the way it turned out. This shot took me about 10-15 minutes to figure out the lighting, with test shots, that's really too long for real estate shooting, especially for one room, but taking the extra time results in a happy client, and additional jobs! This image is a single shot. I think the camera data is F/7.1, ISO 200, WB 5700k, shutter 1/160sec. No gels used. Sony wireless flash system used to trigger flashes. Post processing; I removed a shadow from the ceiling on the right side, heavily cropped off the left part of the image, (composition didn't look good), and cloned out two small reflections from two window panes in the dead center from my hand-held flash. I did the usual slight shadow/highlight adjustments, and that's it. Has anyone ever checked out the gigapixel images out there, usually made by stitching thousands of DSLR shots together to form a single image. Check these out. After you look through the top ten or so, you'll soon discover that they're.......booooring!! I guess someone forgot to tell them that size doesn't matter, especially in photography! Apparently, in order for the images to look right you have to shoot when the sun is high in the sky, or when it's cloudy to avoid stepped shadows from sun movement during the long shooting process. Instead of taking 10k-12k shots to make one image, maybe it could be pared down to a couple hundred, involving much less time, and making it easier to shoot earlier or later in the day when the light makes things more interesting! There is an alternative to the stitching or mosaic process, like making a single image using one huge piece of film, like these people did. The shots look good, but this is not something the average person will be able to do. If you're interested in trying out digital gigapixel images, (and hopefully making better pictures than the ones you saw from 10,000 shots), check out the automated systems available. I forgot to mention in the last entry that I'm probably not going to have the Sigma 70-200mm reviews ready until next month due to problems. However, check back daily as I have quite a few lens and equipment reviews coming up. In other news, I'd like to expound on my filter suggestions from the 3/7/11 entry. The 77mm B+W slim MRC UV haze (clear) filter works very well for lenses with noticeable light fall-off, as this filter doesn't introduce more, like a regular thick filter might. It would be good for use on the Sony CZ 24-70mm (info) or 16-35mm, (info). If you're outside in harsh conditions, I'd definatelly leave a clear filter on, better to wipe crud off the filter than the lens element. Indoors or for light outside use, I wouldn't use a clear type filter because it can cause additional flare and ghosting, although I'd leave the hood on. I also have a 62mm B+W MRC polarizer, purchased for the CZ 16-80mm, it's pricey and no better than a Hoya or Tiffen. I keep a 77mm B+W 1.8 ND filter too, it's good for 6 stops. It's a slim filter, and that's important if you're stacking them, sometimes I stack the 1.8 with a .9, (3 stops) for a total of 9 stops, but not very much, that's a lot of light loss, and a tripod is a must. I don't use ND filters much, but it's a good idea to have at least one on hand to take advantage of a special photo opportunity if it presents itself. Suggested use would be to allow slow shutter speeds for catching movement in subjects like waterfalls, clouds, or cars etc in a bright environment. B+W filters are expensive. Most have brass rings and won't stick to the lens if tightened down too hard as sometimes happens with aluminum rings. If build quality is important, look carefully at B+W, if that doesn't concern you, go with Hoya or Tiffen, image quality is just as good IMHO. Sony DSLR users may, or may not know they don't get any visual benefit from sensor-shift type image stabilization, that is, the Sony SteadyShot stabilization only begins its job once the mirror is up and out of the way, after you press the shutter button. Canon and Nikon DSLR users have grown accustomed to seeing the smoothing effects of their lens based image stabilization, which runs independently from the shutter action. Things are changing though; Sigma and Tamron have recently come out with their own versions of lens based IS systems available in the Sony alpha mount, Sigma calls their system OS for "Optical stabilizer" and Tamron uses VC, or "vibration compensation." Go to the Sony SteadyShot VS Sigma optical stabilizer page for a full report. This is a general summary of my narrow use of the Sigma OS system only, and not meant to be broad and scientific in nature. To sum this up; YMMV, meaning my results here may not be the same as what you'll get using the same exact testing procedure. You may be more steady, or more shaky than I am. Please read the whole intro before looking at the crops. I thought it would be interesting to start showing some interior/exterior shots from the Sony A700 and Sigma 10-20mm F/4-5.6 lens, (info), and how I went about shooting the scene, since there are a few people out there that have asked. I'm choosing that camera/lens combo because it's pretty much outdated now, but totally usable, and helps illustrate the simple fact that your camera doesn't matter, even when being paid good money. My new Sony A580 is superior in image quality to the A700, but I still use the A700 for most work, because I'm so comfortable using it, and it'll take me some time to get "comfortable" with the new camera. In fact, I may even wait for the A700 replacement before doing a permanent camera switch. The shot below was taken a few years ago when I had little off-camera flash experience, and little Interior photography experience. I don't like turning down jobs, even when I'm in over my head! Anyways, with the camera and lens mentioned above, the settings were; F/7.1, ISO 200, 10mm with no supplemental lighting. There are a couple of things I like about the image, and a couple of things I don't like. First, the image is somewhat "flat," meaning there isn't a lot of contrast, especially on the beautiful cabinetry, click image for a larger version. Secondly, I used 10mm, which is too wide for interior photography, that focal length makes things look odd partly because of perspective (heavy horizontal convergence) and stretched edge issues, and the distortion at 10mm is "mustache" type, which is almost impossible to fix right. I didn't know that back then. I also should have asked for better props, like flower arrangements, and a food prep scene etc. I don't like some of the counter top stuff; the coffee maker, phone and monitor should have been removed. I do like the fact there are no reflections, and nothing is blown out. Colors are accurate, and I think the composition is good despite the clutter. The initial flash shots were poor due to "hot spots," shadows and reflections all over the place, a result of poor flash use, so I ended up using a 3 shot HDR set (photomatix). I used a fairly heavy amount of post processing work to get rid of the typical "HDR" look, like lousy color shifts and ugly shadows and highlights. I also fixed the lens distortion as best I could, (most noticeable along the cabinet door on the left), then straightened and cropped the shot. 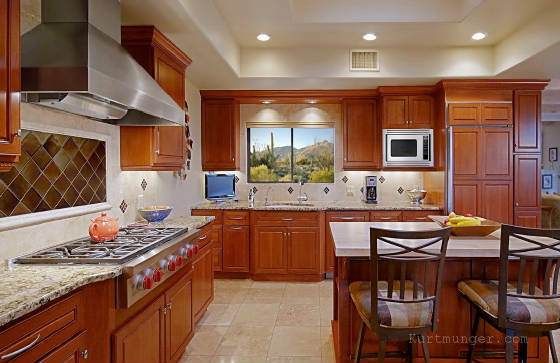 The final image shows off a very expensive complete kitchen remodel in Tucson Arizona. In the end, the client was happy, and has hired me for other shoots. Based on email questions, there seems to be a lot of interest in finding information on filters, especially Graduated neutral density, ND, polarizers and UV. Funny, when I gathered all my filters up for inspection, for some odd reason I seem to have three each of Hoya, B+W and Tiffen, plus a whole bunch of Minolta and Cokin etc, but I don't use those much (except the P173). Also funny is the image Tiffen (or B&H maybe) uses on some of their filter ads, like the image below. The scene is Pusch Ridge peak in Tucson AZ, the same peak I often hike up to. It's taken from Oracle road looking southeast. I just thought I'd mention it, not really earth shattering news. I put some useful GND info on the side also. I'm going to review some filters in the near future, although right now I have my hands full with two Sigma 70-200mm reviews. I thought I'd start off with a little info on the Tiffen GND filters, (mine are made in the US). I bought the Tiffen 49mm (grad) ND.6 (49CGND6) for the NEX 18-55mm kit lens. 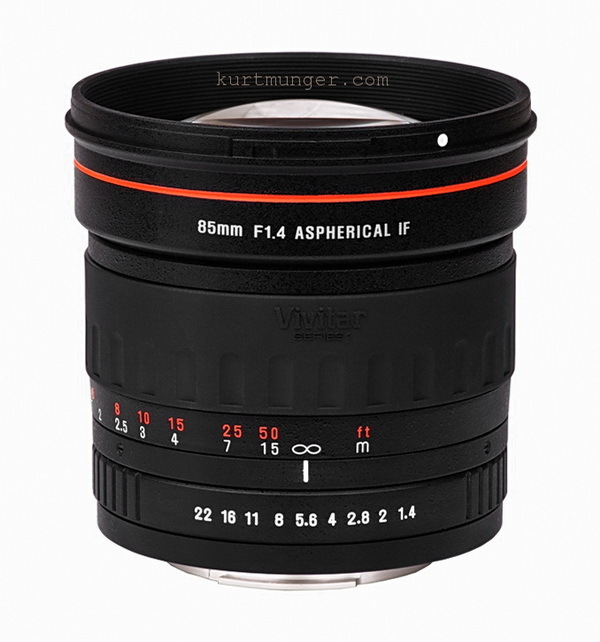 You could also use this 49mm size for the Sony 50mm F/1.8, Sony 28mm F/2.8 or Sony 30mm F/2.8 macro lenses. Additionally, I have a Tiffen 62mm (grad) ND.6 (62CGND6) for the Sony CZ 16-80mm, and a Tiffen 77mm (grad) ND.6 for the Sony pro lenses, 16-35mm, 24-70mm and 70-400mm. I use the 77mm on the Sigma 10-20mm too. Tiffen makes nice filters at a very good price, and are about the same price and quality as Hoya in my opinion. B+W are very expensive, and no better. All three filters mentioned are Graduated, or "gradual" ND filters, meaning they transition from dark to light from the top towards the middle. You can use these for keeping the clouds from blowing out in you images, or turn them upside down for high key areas. They turn just like a Polarizing filter. I use the .6 or two stop ND filters because anything less and it really doesn't make a whole lot of difference, and any more and the skies start to look scary. If you're interested in the intricacies of shutter/flash synchronization but aren't sure exactly how it works, then watch this video by Paul Duncan, he does a great job of explaining it. Topics include how the focal plane shutter works, 1st and 2nd curtain, flash sync, HSS and more in this roughly 9 minute video. I guess I don't quite understand the electronic shutter part where he says it's powered on and off to get a higher sync speed, without the shutter operating, and is not a common capability because the sensor electronics uses processing that would be better used to create a higher quality image. I thought when shooting video, that's exactly what's happening, the sensor is powered on and off, the shutter doesn't actuate at all. So why wouldn't you get, say, a 1/500th sync speed now with the video capability on DSLR's? Also, when I'm over sync speed on my A700, why is my blocked area on top, instead of the bottom as you see in the vid? I understand the image reversal part, but maybe using dumb, off-camera flash mode like I do makes things come out differently. Hmmm, oh well, more mysteries to ponder. I'm working on the Sigma 70-200mm F/2.8 II HSM lens review right now. I should have that ready in a week or so. This is telephoto lens review number two, (out of three) that I'm reviewing, plus the Sony which I have already. 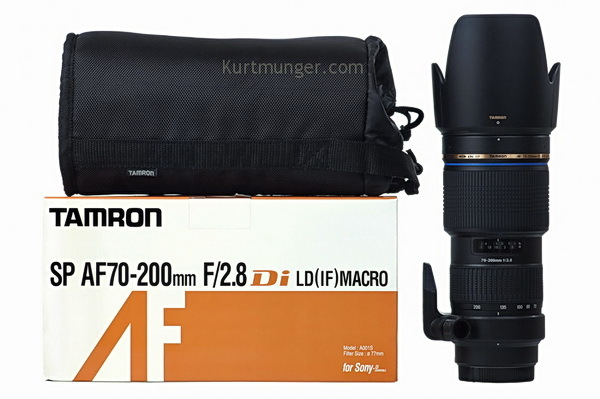 The Tamron SP AF70-200mm F/2.8 Di LD (IF) macro lens is a low cost alternative to the more expensive Sony model, also tested here. Is it worth it? It all depends on how you plan to use it. The Tamron 70-200mm lens performs very well optically, with relatively low distortion, good control of both axial and lateral color fringing, and is surprisingly sharp from F/4-8. The Tamron is well under half the price of the Sony 70-200mm F/2.8 G, so there always has to be some compromises, right? Build quality is not great like the Sony, and instead of silent and fast SSM, you'll get the older slot/screw drive focusing system, which in this case is slow, although pretty accurate. Check out the review if you're interested in my assessment of this lens. Readers have long demanded some changes concerning page load times and test images on the lens reviews, so I've decided to acquiesce and put the test sample crops for both APS-C and full frame on a separate page, with reference images!! Hopefully by splitting up the review people with dial-up service (or lousy broadband) won't have to wait too long for each page to load. My problem; since day one I've put the entire lens review on a single page, and my newer reviews offer much more in the way of samples and information than I originally intended. So now that's been fixed, and I can add even more! The main review page has been changed slightly towards the top. The link to the second, or "test samples" page will be at the beginning, under the first lens image, and again just above the Conclusion. The test sample page is wider than the regular page, so if you're using a standard 4/3 monitor, you might want to wipe out your fav list or bookmarks and view it full screen. This site is best viewed with Firefox 3.0 or higher. The new video is out about HDSLR shooting. This first episode is about camera settings, using a Canon camera, but most of it will translate to a Sony camera. I noticed the audio and video are not synced properly. I know some of you are concert shooters out there; a reader wrote me a few times (with lens questions) that has a recurring gig shooting Eddie Money concerts. I don't do that kind of photography (although I wouldn't mind trying) so I wasn't much help. I found a good site to go to if you're interested in doing this, or getting started, it's called ishootshows.com; the guy does great work, and looks like he's glad to answer questions. He also explains what lenses etc he used for the show and other info, check it out.